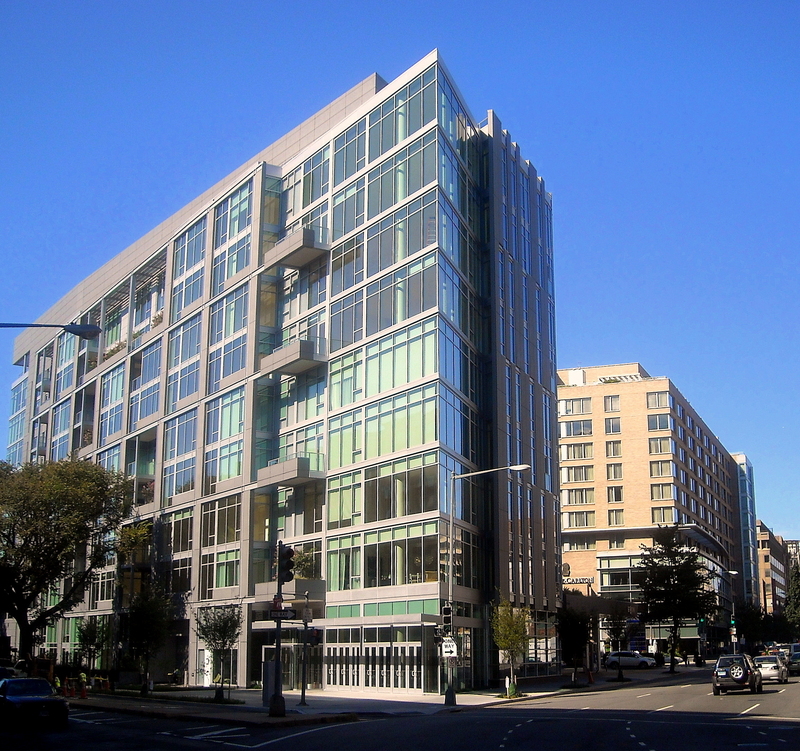 In My Backyard – DC | DC laws give NIMBYs a lot of power to say no to any new development. We give District residents a way to say yes. Mayor Bowser thinks giving homeless people places to live throughout DC would be preferable to warehousing them in an abandoned insane asylum. Others think not. Selecting a location for public housing is the NIMBY problem par excellence. Support for housing these families is almost universal in DC, but no one wants a shelter to pop up next door. The textbook solution for selecting sites is to develop a fair rule ahead of time (e.g. one shelter in each ward in the most cost effective location, etc.) and to compensate those who are hurt by creation of locally unwanted land uses (LULUs). Skeptical writers have accused these Concerned Neighbors® of arguing in bad faith, but it may be best to take them at their word. Maybe people wealthy enough to spend more than a million dollars on real estate really do have more to lose from the location of public housing than poorer residents in other parts of DC do. “Across the street from a homeless shelter” isn’t exactly a selling point, after all. Upper Northwest has long been considered a refuge from more urban DC problems, thanks in no small part to the zoning and development regulations that keep building and development at bay and, of course, average rents far out of reach for undesirable people. But in these BANANA quarters, little consideration is given to the primary killer of urban land values: the amount of development legally allowed on that land by zoning and other land-use regulations. That is, NIMBYism may keep average rents high, but it can do the exact opposite for land values. 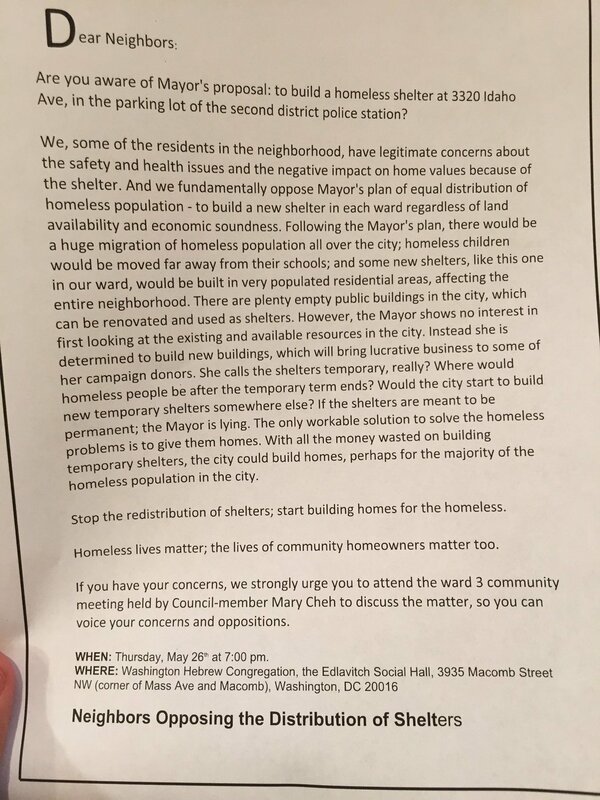 Instead of building homeless shelters, Mayor Bowser should offer the Concerned Neighbors® a compromise: keep the homeless shelters in poor neighborhoods, but upzone the entirety of Wards 3 and 4 to C-5, the densest mixed development zoning district allowed under DC law. A handful of shelters really isn’t going to do much to end the region-wide housing crisis, but greatly upzoning several square miles of real estate–already equipped with an underground rail network–will do quite a bit. It will also greatly increase land values in these wards, even as average rents fall. Upzoning Wards 3 and 4 would be great for the city, but it would have the side effect of essentially dismantling some socially-exclusive neighborhoods as landowners sell out to developers, one by one, and detached houses give way to more affordable apartment buildings. But that can’t be worse than having to interact with homeless families. After a long effort behind closed doors, D.C. politicians have reached a deal to replace Robert F Kennedy Memorial Stadium and the wasteland of empty parking lots that separate if from NE. The decaying building is almost always empty–including when DC United plays–and has begun to resemble mid-nineties Sarajevo. Aside from the occasional cyclist or student driver, it is completely abandoned 350 days per year. Razing the stadium is a great a idea, but replacing it with another is extremely foolish, especially because there are other people waiting in line to give us a free stadium. The complex occupies 190 acres of prime riverfront real estate, but only a small percentage of that space is actually a stadium. The National Park Service owns the land itself and currently requires it to be used for recreation while the District Council leases it. This seems like quite an obstacle to residential development, but the requirement could easily change if our mayor and council members invested the same amount of political capital they have spent advocating for billionaire team owners. The best outcome for the District would be for NPS to raze the stadium and auction the land in small parcels. If redeveloped at a density similar to Columbia Heights, nearly 20,000 new residents could live in the District. Those already living here would have a plethora of new options for dining, shopping, and other services. Redevelopment would be a revenue windfall for District coffers, and construction would be entirely financed by developers and homeowners taking advantage of the new land. Preserving RFK’s status as a sports-themed dead zone probably means giving hundreds of millions of tax dollars to local billionaires and getting little in return in terms of economic development or tax revenue. Mayor Bowser’s prior sports indulgences with extremely speculative public benefits, such as a $50 million basketball practice court, indicate that she’s likely to give away much more to build a football stadium. The stupidity of building a new stadium instead of housing and commercial space is compounded by the fact that we don’t actually have to choose between the two. If we build housing at RFK and forego a stadium, there are gullible Marylanders a mere seven miles away who will build us a stadium with their own tax revenue. Despite the lack of economic development surrounding RFK or FedEx Field, Prince George’s County politicians are clamoring to repeat the mistakes of the past. If they’re willing to pay for our team, let’s benefit from their foolishness and make the District a better place to live at the same time. Emily Badger has a great post at Wonkblog about why rental housing is so expensive in the District. Height limits, parking requirements and zoning restrictions all push up the cost of construction. So do lengthy design reviews and legal battles with neighborhoods opposed to new development. Developers must also build at the densities communities allow, and in the limited places where they allow higher density. And if a given parcel of land is only zoned for about five stories of apartments, those apartments may have to command $2,500 a month each to make the project profitable. More importantly, focusing on luxury units reverses causality. Housing isn’t expensive because developers are building costly, luxury buildings. Rather, they decide to build luxury units because housing is so expensive to begin with. If developers decided to build spartan apartment buildings–no granite counter tops, no decks, basic appliances, cement floors, tiny windows–these units would still be extremely expensive and out of reach for working-class renters. Wealthier residents are willing to pay for location, and they’re willing to pay more than lower income residents can afford. Even if developers decided to forego the entire building itself and just sold a tent on a dirt lot, that unit wouldn’t be affordable in a prime location. In Shaw, for example, someone just paid $1.2 million for dirt without the tent because the potential value of building homes is capitalized into the land. In some of our leading cities, land (and the legal entitlement to build) is often worth more than the homes built on them. Developers do, in fact, build nice units with lots of amenities, but this is simply catering to the people who have enough money to pay DC’s sky-high rates, not a cause of high rates themselves. Regardless of the costs developers face, housing prices are still set by supply and demand. The regulations Badger pointed out are indeed drivers of rental prices in the District, but the mechanism is constraining supply, not luxury units. *As Donald Shoup has shown, minimum parking requirements cause developers to build fewer, but larger, units within a building of given size because providing additional parking spaces is not only costly, but also physically infeasible in many cases. Many jurisdictions require certain number of parking spaces for each unit, rather than basing requirements on square footage. A developer may then build a suboptimal, but still profitable, building with larger, more expensive units (if the development moves forward at all). DC laws give NIMBYs a lot of power to say no to any new development. We give District residents a way to say yes.